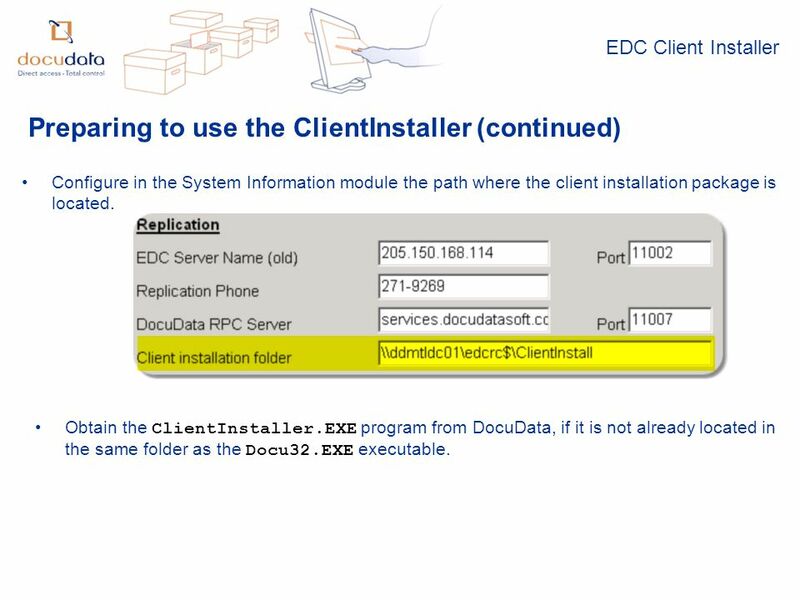 EDC Client Installer An installation program which installs the EDC Client software on a workstation, for a client of your record center, with the data. 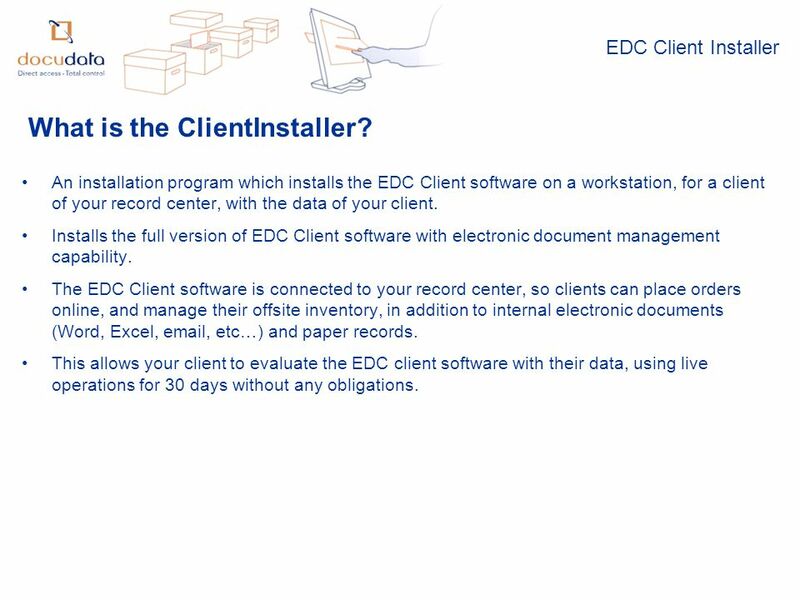 1 EDC Client Installer An installation program which installs the EDC Client software on a workstation, for a client of your record center, with the data of your client. Installs the full version of EDC Client software with electronic document management capability. The EDC Client software is connected to your record center, so clients can place orders online, and manage their offsite inventory, in addition to internal electronic documents (Word, Excel, email, etc…) and paper records. This allows your client to evaluate the EDC client software with their data, using live operations for 30 days without any obligations. What is the ClientInstaller? 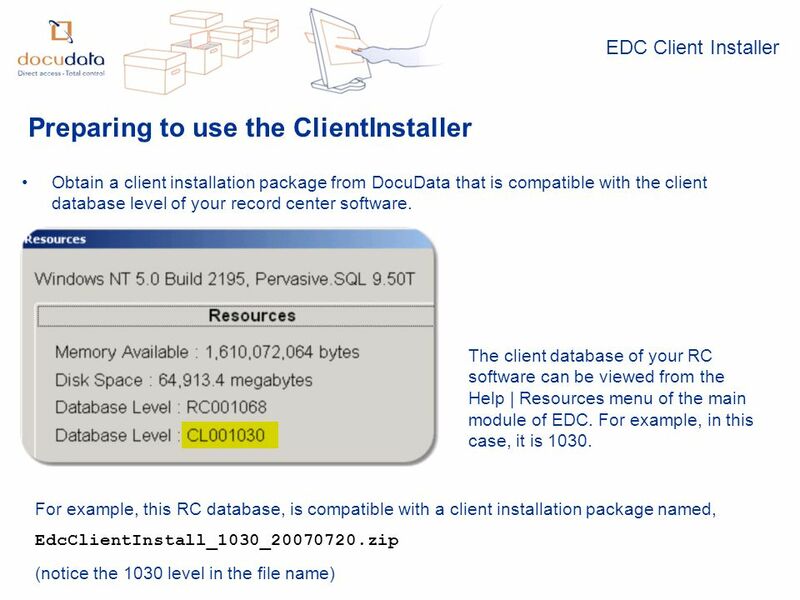 2 EDC Client Installer What you need as a Record Center The Replication service must be active at your record center using the EdcRpc.EXE process. 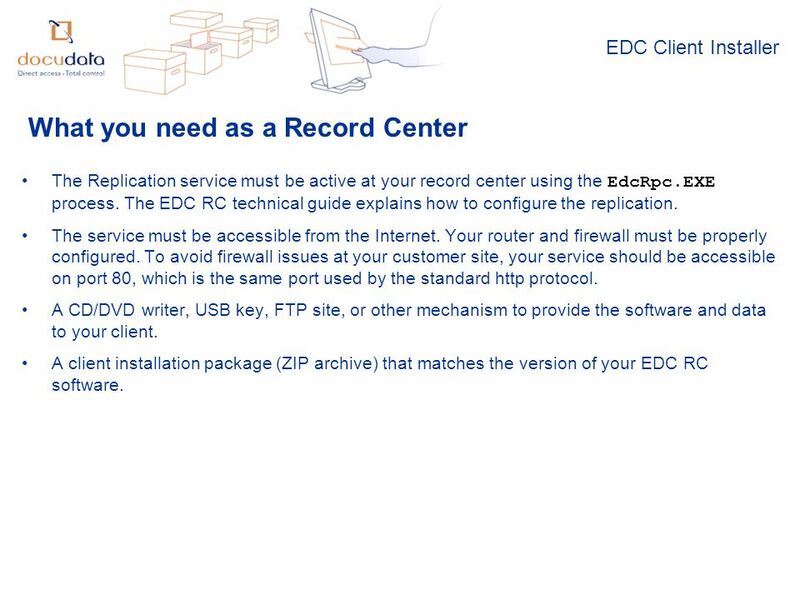 The EDC RC technical guide explains how to configure the replication. The service must be accessible from the Internet. Your router and firewall must be properly configured. To avoid firewall issues at your customer site, your service should be accessible on port 80, which is the same port used by the standard http protocol. A CD/DVD writer, USB key, FTP site, or other mechanism to provide the software and data to your client. A client installation package (ZIP archive) that matches the version of your EDC RC software. 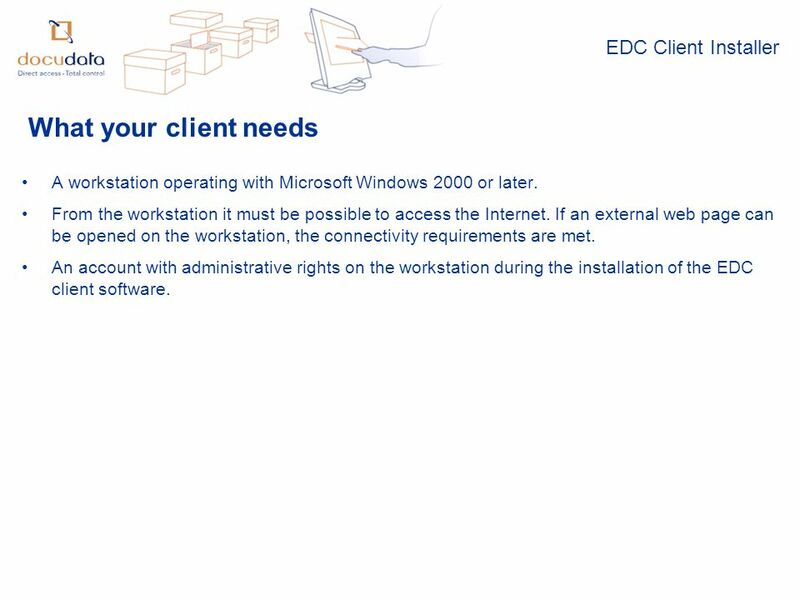 3 EDC Client Installer What your client needs A workstation operating with Microsoft Windows 2000 or later. From the workstation it must be possible to access the Internet. If an external web page can be opened on the workstation, the connectivity requirements are met. 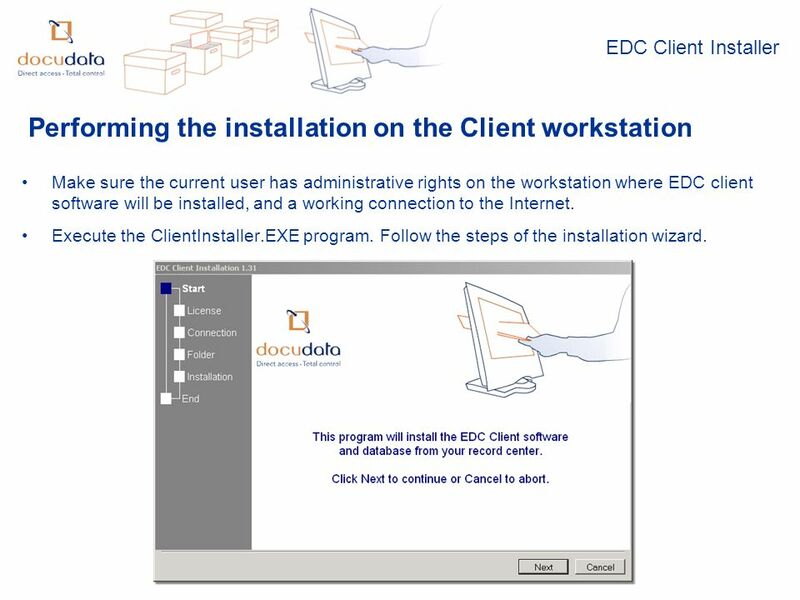 An account with administrative rights on the workstation during the installation of the EDC client software. 5 EDC Client Installer Preparing to use the ClientInstaller (continued) Configure in the System Information module the path where the client installation package is located. Obtain the ClientInstaller.EXE program from DocuData, if it is not already located in the same folder as the Docu32.EXE executable. 7 EDC Client Installer Performing the installation on the Client workstation Make sure the current user has administrative rights on the workstation where EDC client software will be installed, and a working connection to the Internet. Execute the ClientInstaller.EXE program. Follow the steps of the installation wizard. 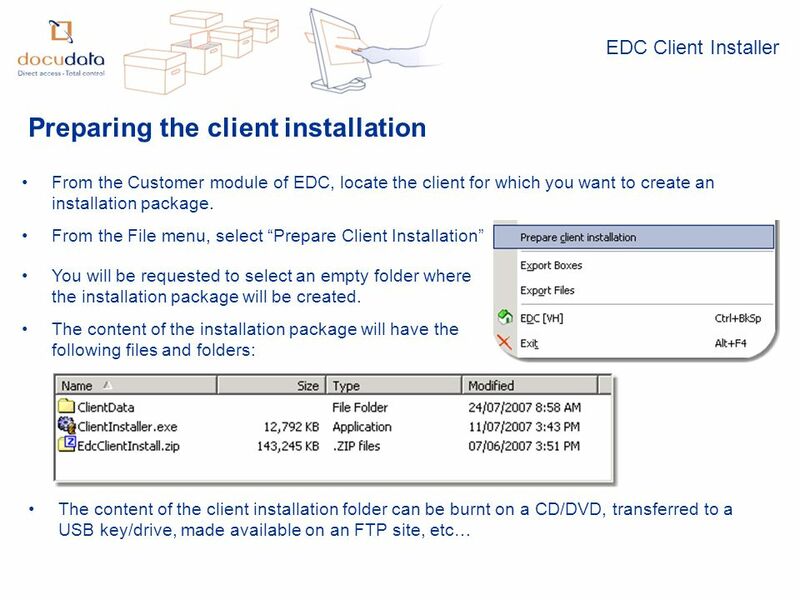 Download ppt "EDC Client Installer An installation program which installs the EDC Client software on a workstation, for a client of your record center, with the data." Transfer Content to a Website What is FTP? File Transfer Protocol FTP is a protocol – a set of rules Designed to allow files to be transferred across. Online Tenant Request System Reliable and accurate, the IMPAK online tenant request system significantly reduces telephone time and paperwork. Module 5: Configuring Access to Internal Resources.  2003 Prentice Hall, Inc. All rights reserved. Chapter 21 – Web Servers (IIS and Apache) Outline 21.1 Introduction 21.2 HTTP Request Types 21.3 System. Skills: install and use Filezilla Concepts: client-server, file transfer protocol (FTP), portable software, wire-frame user interface diagram, Web site. 1 Configuring Web services (Week 15, Monday 4/17/2006) © Abdou Illia, Spring 2006. 12-Aug-15VL Download Center1 Volume Licensing Download Center Electronic Software Fulfillment for Volume License Customers Go Live: November 13, 2006. BASIC COMPUTER OPERATION. OUTLINE Computer Hardware Computer Hardware Operating systems Operating systems Terms Terms Disk capacities Disk capacities. Hands-On Microsoft Windows Server 2008 Chapter 8 Managing Windows Server 2008 Network Services.